Plot: Picking up where the 1980 Superman II left off (and wisely ignoring Superman III and Superman IV: The Quest For Peace), this film opens five years after scientists pinpointed Krypton in space, and Superman left Earth to examine the remains of his dead planet. Back on Earth, Lex Luthor (Kevin Spacy) is claiming a vast fortune pulling a scam on a dying woman (the original filmic Lois Lane, Noel Neill, in a cameo). On his yacht, Lex tells his new girlfriend Kitty Kowalski (Parker Posey) his plan – to find and raid the arctic fortress Superman left behind for the crystal technology that ran Krypton. In Kansas, Martha Kent (Eva Marie Saint) sees a startlingly familiar sight: a spacecraft landing on her property. 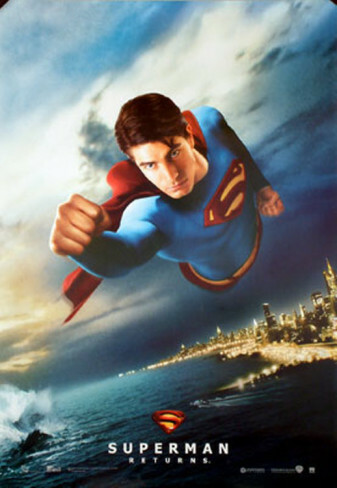 She finds her long-missing son, Clark (Brandon Routh), exhausted from his return to Earth from Krypton. In the morning, rested, he tells his mother all he found of Krypton was a graveyard. Returning to Metropolis and the Daily Planet, he reunites with Jimmy Olsen (Sam Huntington) and Perry White (Frank Langella), but Lois Lane (Kate Bosworth) is out of the office, covering the launch of a new experimental spacecraft. Examining her desk he sees she’s moved on in his absence, winning a Pulitzer Prize for an editorial explaining why the world doesn’t need Superman, getting engaged to Perry White’s nephew Richard (James Marsden), and having a son named Jason (Tristan Lake Lebu). Luthor demonstrates his plan to his henchmen, using the Kryptonian crystal technology to create a new land mass. The experiment causes an electrical pulse that shuts down power across the country, including the tandem space shuttle/Boeing Lois is on board for the launch. The news reports on the damage to the twin aircraft, and Clark springs into action. Superman, making his first appearance on Earth in years, saves the two vessels and everyone on board, and the world cheers his return. Back at the Planet, Perry and Lois bicker over their coverage, with Lois wanting to write about the blackout and Perry wanting to focus on Superman’s return. Lois is glad to have Clark back, but he soon realizes she’s carrying a deep anger towards Superman for leaving without saying goodbye. Superman glances in on the family that night, where he hears Richard ask Lois if she was ever in love with Superman, a notion she denies. When he speaks to her later on the rooftop of the Planet, she pointedly tells him the world doesn’t need a savior, and neither does she. Luthor has Kitty stage a car accident to distract Superman while he breaks into a museum to steal a chunk of Kryptonite. As he plans, Lois tracks down the source of the blackout to Luthor’s yacht and, with Jason in tow, is captured. Luthor explains his plot – to create a new continent of his own that will engulf most of the United States, and he’s got the Kryptonite to back it up. When Jason has a reaction to the Kryptonite, Luthor asks Lois just who the boy’s father really is. Combining the Kryptonite with a crystal stolen from the Fortress, Luthor begins growing his new continent off the coast of Metropolis. Lois sends the coordinates of the yacht to the Planet office, where Perry, Richard, and Clark are searching for her. When she’s caught by one of Luthor’s thugs he threatens her, only to be flattened when the wheezing, asthmatic Jason hurls a piano into him. Her fax makes it through and Clark and Richard (in his seaplane) both fly to her rescue. As they do, the growing continent sends out an earthquake that hits Metropolis. With Superman trying to minimize the damage to the city, Richard reaches Luthor’s yacht first, but a tidal wave takes it down. Superman pulls it above water and sends Lois and Jason off with Richard while he goes to Lex’s new landmass to face him, unaware of the Kryptonite in its makeup. Luthor begins beating the weakened Superman and Lois begs Richard to turn back so they can help him. They find him stabbed by a Kryptonite crystal. Pulling the Kryptonite from his side, Superman dives beneath the ocean, ripping the growing landmass from the water, and hurling it into space. He crashes to Earth, nearly dead. As he recovers in a hospital, Lois and Jason visit him and she whispers something in his ear. When he recovers, he again goes to Lois’s house, looks in on Jason, and remembers his father Jor-El’s long-ago words to him… how the son becomes the father, and the father, the son. He promises Lois he’ll always be around, and flies once more into the sky, to gaze down on the Earth from above. Thoughts: I know I’ll catch crap for this, but I’ve always felt Superman Returns was unfairly maligned by a lot of people. It’s not a perfect film, by any stretch, but neither is it as bad as so many make it out to be. After so many years without a Superman film, watching other superheroes populate cinemas, the opening sequence of this movie was just what we needed: a fantastic tribute and update to the Richard Donner/John Williams sequence from 1978. The biggest problem with this movie overall, I think, is that it’s somewhat too faithful, too reverent to the Christopher Reeve films. Lex Luthor’s plot, just like in 1978, is essentially a massive, very deadly real estate scam. Marlon Brando is brought back to reprise the role of Jor-El despite the inconvenience of being dead. (They used archive footage shot for Superman II but unseen in the theatrical cut. Quick aside here – in 2006 Warner Bros released Superman II: The Richard Donner Cut to DVD. If you can find it, watch it. It solves virtually every problem with the original cut, and probably could have been a masterpiece if producer Alexander Salkind and Richard Donner hadn’t had a falling-out.) They brought back Noel Neill and her Adventures of Superman TV Jimmy Olsen, Jack Larson, for cameos. Composer John Ottman makes liberal use of the John Williams score, and even that opening sequence spins through space just like the original, but with flashier effects. This is the good stuff, but the screenwriters and director also brought with them limitations that shouldn’t have existed anymore. In the 70s and 80s, before special effects technology could give us dinosaurs that we believed were real and outer space battles that could match any real aerial combat, the Christopher Reeve Superman was limited in how physical he could get with his opponents. His most intense battle in four films was that with the three Kryptonian criminals in Superman II, and while that Battle of Metropolis is impressive by the standards of the time, it doesn’t deliver the sort of Red Bull-charged action modern audiences demand. Most of the Reeve’s Superman’s feats were of the rescue variety, without a lot of actual violence, because what human foe could possibly stand up to the Man of Steel in a physical confrontation? That said, in those moments where the film makes the most of these techniques, it does it well. The scene where Superman rescues the airplane (itself a bit of a nod to the 1986 John Byrne Man of Steel comic book) is as visually exciting and thrilling as anything I’ve ever seen on screen. His efforts to stop the destruction of Metropolis are exciting and visually satisfying. If the rest of the film had the energy and power as those sequences, there would be nothing to complain about at all. Even the airplane scene, though, ends with a nod backwards – Routh cribs Reeve’s line about flying being, statistically, the safest way to travel. Let’s talk about Routh, now. Of all the ways I think this film got a raw deal, Routh got it worst. His performances as Clark Kent and Superman were both really good. As with everything great about the film, though, the greatness comes through imitation. Routh does the best impression of Christopher Reeve’s Clark Kent and Superman duet any actor possibly could, imitating his voice, his tone, his mannerisms, his speech patterns. It’s an impressive performance, but it’s not really his own. The same goes for Kevin Spacey as Lex Luthor – he’s doing a Gene Hackman impression. It’s a very good Gene Hackman impression, with the sort of manic energy that would swing from subtle moments of frustration to wild anger with lots of solid humorous moments in-between, but it’s an impression nonetheless. The only major performer not doing an impression is, ironically, also the worst thing about this movie: Kate Bosworth as Lois Lane. While Routh and Spacey drew on Reeve and Hackman, Bosworth has none of the fire or spark that Margot Kidder brought to Lois Lane, and as those are her two most defining characteristics, we’re left with a bland and lifeless performance. Neill and Kidder both gave us Loises that felt like a real match for Superman, a brave, witty, intellectual equal who lived up to being a love interest for the world’s greatest hero. Bosworth simply never feels worthy of the role, and she and Routh have no chemistry together whatsoever. Kidder’s Lois was a joy to watch, even when she was just sitting around the Planet office asking for orange juice (“freshly squeezed”). Every moment Bosworth is on the screen, I’m just waiting for the scene to end so we can move on to something interesting. Plotwise, Jason is another issue that doesn’t make a lot of sense. The fact that Clark left a son behind when he left Earth inspired a lot of “deadbeat dad” jokes that aren’t really fair – you can’t blame a man for not taking care of a son he didn’t know existed. (That doesn’t quite excuse the scene where he spies on her at home, mind you.) That said, we’re now being asked to accept that human and Kryptonian DNA could mingle and create a half-breed. I suppose we can accept that, if we can accept a world where a journey from a red sun to a yellow one allows a person to fly… but if that’s the case, why is Jason so frail and sickly until the plot demands otherwise? The idea here is clear – Singer and the screenwriters wanted to employ the unused Marlon Brando “son becomes the father, father becomes the son” speech from Superman II, and they wanted to do that by giving Superman a child and removing from him the weight of being the literal “last son of Krypton.” That didn’t come across, though. In practice, Jason just weighed him down more, and probably would have been even more difficult to deal with had they ever moved forward with a sequel. In my opinion, the good in this film outweighs the bad, but it suffers mainly from not being what people wanted out of the franchise at the time. It would be another seven years before a new movie would try to resurrect Superman again, this time deliberately starting from scratch and doing away with the trappings of Donner, Williams, and Reeve. Just last week, Man of Steel hit theaters. Come back tomorrow, and I’ll tell you how well it succeeds. At the time I write this, I still haven’t seen Man of Steel yet (although I will have by the time you read it), so I’m as excited as anyone to see just how it all turns out.